When treating friends from far away, the warm-hearted Dai folks in Xishuangbanna often serve a special dish on the dining table: they would pick up some white flower petals from small trees around their bamboo buildings, wash them, concoct the petals with eggs and fry the mixture in a pot; after assorting the fried stuff into delicate patterns, they would ask the guests to have a taste of the delicacy (Picture 7.01-07 a delicacy cooked with Frangipani). Since the dainty dish appears noble, elegant, and beautiful and looks like unique artworks, the guests often feel it�s a reckless waste of food before trying. 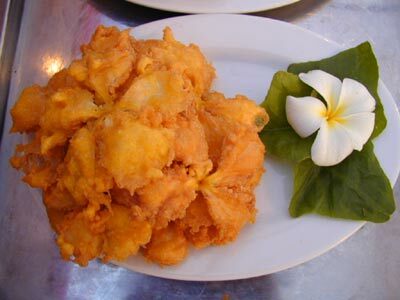 After exchange of a few words, the guests get to know that this dish is cooked out of frangipani � a kind of defoliate arbor of the nerium indicum family; and the flower gets its name, frangipani, which means the egg flower, because it has white and clean flower petals as well as whitish yellow eyes that look like a yolk being enwrapped in egg whites. The bloom season of the elegant and dignified frangipani is from April to May each year, and the flowers are sweet and refreshing; the five pieces of flower petals laps on one another like wheels, which quite resemble the paper winnowers made by children. Besides the white fangipani, there are also red and yellow frangipanis; essences can be extracted from all frangipanis for the production of high-rank cosmetics, fancy soaps, and additives of foodstuffs. The essences are sold at very high prices; therefore, the frangipani trees have great potentials for commercial development. The frangipani flowers can also be made into teas after being sun-dried, which is normally called the frangipani tea; and the tea has effects of curing fever, wiping out diarrhea, cleaning the lungs and detoxification. The local folks of Xishuangbanna believe in Buddhism and almost all Dai villages and blockaded villages have Buddhist temples. Frangipani is listed as one of the �five trees and six flowers � to be planted in the temples; therefore, we can find widespread planting of frangipani in every part of Xishuangbanna. In the tropical tourism sanctum, Hawaii, the local folks often pick up the flowers of frangipani and piece them into garlands, and they would put the garland decoration around their necks as a decoration on festivals; therefore, frangipani is also the symbol of festivals in Hawaii. Frangipani is quite popular in the Laos, and people of the Laos choose it to be their national flower and pay a special homage to it. Frangipani trees are good-looking. Their caudexes have many branches, which are grotesque in shapes and varied in forms; their leaves look like loquats, and after the leaves fall in winter, they will leave some semicircular traces on the branches, which look like specks grown on buckhorns; so, to some extent, we must say that frangipani is the first choice arbor for forestation of gardens, decoration of courtyards, and for potted planting in the tropical regions. The cortex of Frangipani trees assumes a grayish green color and is rich in contents of a whitish and toxic liquid, which is often used as a medicine and can be used for dressing trauma and for treating sores and bumps etc. The wood of the frangipani tree is white, light and soft, and can be used for the manufacturing of musical instrument, tableware and furniture. The native land of frangipani is in Venezuela of South America, however we can find its traces in all tropical and sub-tropical regions in all around the world today.